Hi everyone, here after a long time. My female dobe is now almost an year old but there a problem. She had UTI when she was 4 months old but it was cured. Now whenever someone visit our home (friends/family) she keeps barking and does not come close or trust them easily. If someone approaches to her just to pet she gets scared and pee all over. This happens when i take her to walk as well and if i come across any friend while on walk and stand and talk. She gets too scared and pee. Is there anything i can do to fix this? Does she have any health related issue? Help. This sounds like a temperament or socialization problem. At her age it is going to be harder to work her out of versus if she were a young puppy. My suggestion would be to work with a dog behaviorist who can show you methods on introducing her to people and building her confidence. I don't think it has anything to do with her having a UTI as a puppy. What kind of experiences did she have with meeting new people as a young puppy? Did she get to meet new people often, and was it a positive experience for her? If she didn't have a lot of exposure to new people as a very young puppy and/or it wasn't a positive experience, that can be a huge issue. It could also be genetic temperament issues that you're seeing. I know you're in India, so I'm not sure what kind of trainers you have access to? It sounds like your girl is extremely fearful of new people if she is actually urinating when she meets them. You can work on this very slowly to make her more comfortable, but you have to do it slowly, and you need to keep her far enough away from strangers that she's actually comfortable. Are there any dog trainers near you that use positive reinforcement and understand fearful dogs? Hi, she is scared and not at all excited. When i got her i made sure to socialise her. I kept inviting kids around the block to my home to play with her and even had guests but she always used to be happy when they were around and play with them. As she's getting older she cannot digest new people at all. Although she remember every kid in my street because i let them play in a ground in front of my home with all the kids. I had my friends from other city at my place when she was a puppy and she used to play with them. They come once every month but last time they came she could not remember them and when they approached her she ran backwards and kept peeing. I tried to positively pet her but she keeps running away and gets normal after an hour or so. I tried to hire a trainer who had good reviews on Google but he was the worst trainer i've ever seen. I hired him and i had to go to a weeding in another city for 3 days. I came back and got to know he was teaching them by hitting them. I kicked him out of my home when he came next time. There's a good trainer in India but he's not in my city. Hi, read my first quote regarding meeting new people as a puppy. I tried to keep some treats with me when new people came and i tried to pet her and give treat but she wont even eat treats. She comes really slow and smell them but as soon they move even a bit she runs away bark at them and possibly pee as well if any of it is left. Also, i tried to contact the Vet i usually take them to. He suggested that there are drugs for this to have a control over it but he suggested to do nothing and just work with her as its not a major issue. So far it sounds like you're on the right track, but sometimes these things are difficult to work with and you can never entirely get rid of the fear. The nasty trainer likely made things worse too. You need to keep her far enough away from other people that her fear/bark/pee/flight cycle never gets triggered. In your house, don't try to get her to approach people; don't ask other people to try to greet her--let her approach them at her own speed. Ask your visitors to totally ignore her, not to try to get her to come to them and not even to really look at her. You can give them a treat to give her or to put on the ground near to her if she approaches, but ask them not to make a big deal of it. Just make the treat something nice that appears when she is near someone, not necessarily an actual lure or focused reward for getting close. Find her a place where she can see new arrivals come in and watch them, but where she can feel safe if possible. Give her a bed and safe place there and teach her to go to it. Reward her in that space, but don't make her stay there when you've got company--you want her to try to approach your visitors. You can praise her very gently (just a casual, mild and loving "hi sweetie" when she approaches someone, BEFORE she gets worked up), but don't coddle her or try to push her to keep getting closer, especially if she is showing signs of fear. Basically the same thing applies when you're out of doors. On walks, try to keep far enough away from other people that she never kicks into her fear mode, even if it means crossing the street or turning around and going the other way if you see her start to alert in a fearful way when she sees someone coming. Teach her to pay attention and focus on you ("watch me") so you can ask for her attention when you need to pass by someone. The most important (and probably most difficult) thing is to stay far enough away from whatever she is afraid of that she never gets all of the way to the bark/pee response. Praise her; treat her...do all of those things before and only when she is not fearfully aroused to the point of barking/peeing/running away. Keep an eye on your surroundings; think ahead; ask her for attention if you see something coming that may cause problems for her. You may find that she needs a lot of distance from people at first, but you should be able to get closer and closer as time goes on. It is likely to take a very long time to get her moderately comfortable in allowing strangers to come close. In the real world, you probably won't be able to avoid people like that all of the time. That's OK, just do your best. You can try to stop to the side, and let her just look at people as they go by. If she gets fearful, cringes or starts to bark and you can't really avoid the situation, just keep going on about your business. Keep walking, don't yell at her--just try to be casual with a sort of "come on, let's go" attitude as you go past someone. Medication is something you can use to help as you work with her. It is used to help take the edge off of her fear so that she is actually able to calm down enough to learn. A dog with a mild fear issue may not need it at all; it might be helpful as a short term tool. A reactive dog who has a basic shy or nervous temperament may need it as a long term aid to help keep her fearful arousal down to a comfortable level for her. But it is not a cure-all. You need to work on behavior management even if she is on medication; don't expect the medication to do the entire job for you. Last edited by melbrod; 04-15-2019 at 12:29 PM. Sagar - I have read your replies and the other posts to your problem - This is just me thinking here - But I really have to wonder if somebody was mean to her in her younger age ?? I'm not saying you !! But somebody did something out of your sight . Her trust has been broken someway - somehow . The reason I question this is that we had company from out of state stay with us once - the male was scared of Ali -at the time - she was just a pup - after they left the next day - Ali was very spooky - like I had my legs crossed and when I let my foot down on the ground - she ran - we wonder - what was that all about ? It did not stop either - Come to find out - the guy had kicked at her - it took us time to get her worked out of that - much like Mel stated . The trainer , in my book , even the trainer really set youu back ! Hitting a young dog is just terrible ! She is now more fearful - as she is afraid of others now - everybody is mean . I would not let any kids around her at this stage - a scared dog - well - you don't know how she will react - as long as she can get away from them - she goes and pees - but if she could not escape - then she may retaliate = she could bite . I agree with Mel - work with her - but from a distance from others and slowly work closer when you feel she is ready - you may just have to give her a little test - like walk closer and see how she reacts . I don't know if you work with her on Obedience or not - if not - I would start training her in that - like sit , stay , place , figure 8's , that will help build her trust in you even more - you then become a team . All about fearful or aggressive dogs and us (as the trainers) assisting our dogs by building their confidence. Check it out.........you will never find a better trainer than yourself !!!! BAT is an excellent book and training strategy. Thanks a lot for all the suggestions. I will pay attention to every suggestions and keep you all updated. I have trainer her to Sit, Down and stay (she doesn't understand stay) but i cant train her so much because of my working hours hence i hired a trainer but didn't work out. I'll get the book and read and see if i can help her and myself. Thanks a lot for the suggestion. There is the root of your problems right there Sagar . Hi yes i know it was my mistake but the thing is in India laws are not strict for animals and every breeder sell every single pup when they a month old only. I searched for a dobie female of atleast 3-4 months old for 2 and a half months but not a single one was available. So i had to bring Milli home when she was young. I had no choice. Also, i got to know from my mum that my grandma doesn't like her and every-time she tries to go in her room she kicks her out. I think this can be a reason why she's afraid of Adults and is okay with kids around. What do you think? 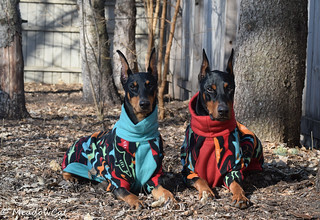 I wish some of the others would jump back in here - there are many Doberman parents that may have better ideas than me on this subject . Stay in touch on here and keep us updated . Here's the copy and paste for you to read . There is quite a range of differing opinions on precisely how old any given puppy should be before they are removed from their dam and littermates to go out into the world on their own with their new owners. While all new puppy buyers of course want to get their pup home as soon as possible and enjoy the very adorable young puppy stage, waiting just a couple of extra weeks to take your pup home comes with a wide range of benefits for the pup itself, which can help to set them up for the entire rest of their lives. The Kennel Club advises breeders that puppies should not be removed from the litter until they are at least twelve weeks old, and in some cases, a week or two older. However, puppies are commonly weaned anywhere between eight and twelve weeks old, which in some cases, means that they may miss out on some of the important things that they can only get from staying with their dam and litter. In this article, we will look at some of the main problems that can arise from weaning a puppy too early, and separating them from their dam and littermates before the age of twelve weeks. Read on to learn more. Proper weaning (moving a puppy on from nursing to eating solid foods only) is something that happens naturally and gradually over time, and should not be forced or pushed. Puppies do not simply go from nursing one day to eating solid foods the next! While a pup is nursing from their dam, they are also getting a whole range of essential, puppy-specific nutrients along with their milk, as well as benefitting from the dam’s acquired immunity and protection against certain conditions and risks. Allowing your pup to gain the full benefit of these things is important, to ensure natural growth and development and that your pup will not become sickly. Puppies are generally weaned completely or almost completely by the age of eight weeks, although many pups will still nurse after this time if the opportunity is there for them. No pup should be removed from their dam until they have spent at least five to seven days eating solid foods alone, and not nursing. Your puppy’s first teachers and friends in the big wide world will be their dam and their littermates, and the time spent within the litter is inherently valuable for the pup in terms of their development. Between three and five weeks of age, your puppy will really begin to learn from their interaction with the other pups in the litter, and develop the basic beginnings of their understanding of normal play and interaction with other dogs. The dam is integral to this process too, and will serve as a supervisor and guardian to your pup, putting them in their place when needed and encouraging them to learn. While with their litter, your pup will learn vital skills including bite inhibition, respect for adult dogs, and how to communicate with other dogs properly. Removing a pup from the litter before they have got to grips with these basics can make it much more difficult to socialise your dog with others down the line. Puppies removed from their dam and litter too young are apt to develop a range of behavioural problems later on, such as attention seeking behaviour, defensive aggression over food, poor housetraining, and destructiveness. Puppies weaned before they are ready are also likely to become more reactive to noises and changes to their environment, and may become fearful or shy when faced with new situations. As well as ensuring that your own puppy gets the best possible start to life, weaning at the appropriate age and no sooner also goes some way towards supporting the welfare of dogs in general. Once the norm for puppy weaning became twelve weeks and not younger, buyers have become more adept at identifying responsible breeders from less scrupulous operations who churn out puppies as a business, and aim to wean and sell them on as early as possible. There is no canine-positive reason for weaning a puppy too early to send them to a new home; early weaning is only ever of benefit to the breeder, and sometimes, in the perception of the new owner who makes the error of thinking that the younger their pup, the better the pup will adapt to the change and be more amenable to training. In order to become a Kennel Club accredited breeder, breeders must keep their pups until they are at least twelve weeks old before parting them from the litter. As a puppy buyer, it is important to know why the twelve week rule benefits dogs, and to make a conscious decision to wait until twelve weeks before taking your puppy home.